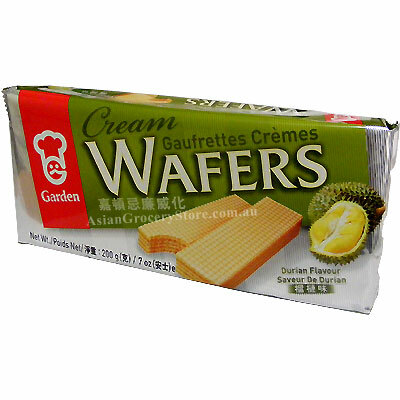 Minimum quantity for "Garden Cream Wafer with Durian Flavour" is 1. Wheat Flour, Hydrogenated Vegetable Oil Shortening ( palm oil ) ( contains antioxidant(ascorbyl palmitate ( E304 ) di - a- tocopherol ( E307),soy lecithin (E322))), Sugar, Whole Milk Powder, Corn Starch, Artificial Colour ( tartrazine ( FD&C yellow No.5) ( E102)), Artificial Flavouring (durian), Leavening/ Raising Agent ( sodium bicarbonate (E500), Ammonium Bicarbonate ( E503), Emulsifier ( soy lecthin ( E322)), Salt. Mirana Brassica Alboglabra - Chinese Brocc.